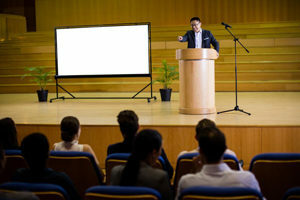 Can a public speaking coach help you? Would You Benefit From A Public Speaking Coach? My executive coaching clients typically come to me suffering from anxiety, insomnia or loss of productivity. These symptoms often present days, weeks, or even months before they give a talk or presentation. When it comes time for them to actually talk, they freeze up. Further, they forget what they planned to say. They feel their voice and hands shake. Their hearts race, their faces flush and they have to fight an overpowering urge to flee. They fear others will perceive them as weak. Worse yet, they feel ashamed of these symptoms. But it doesn’t have to be this way. As a public speaking coach with a background in psychology, I can help you shed insecurities and panic around fear of public speaking. As a result, you move past the fear and progress in your career. My name is Nancy Cetlin, Ed.D. and I’m a performance coach and psychologist with over 35 years of professional experience. I’m currently based in Plymouth, MA but I serve the Boston area, South Shore region and beyond. Because I pair psychology with coaching on public speaking, you enjoy a unique hybrid of training that gets results. Together, we get at the fear that’s holding you back and dissolve it. My clients are often amazed at their transformations. My educational credentials include a BA from Harvard and doctorate from Boston University in Counseling Psychology (1978). Over the years, I’ve taken dozens of courses to expand my learning in order to be best equipped to help my clients. Clients experience breakthroughs because of the powerful combination of techniques from psychology, coaching and neuroscience. My work significantly decreases – and often completely eliminates – performance anxieties such as fear of public speaking. In fact, many of my clients even discover they have a bit of a performer in them. It’s my goal to help you discover your best self. A high level of confidentiality is preferred and provided to Nancy’s clients. If your fear of public speaking is affecting your life, and you’re ready for a change, contact Nancy Cetlin to schedule an appointment now!